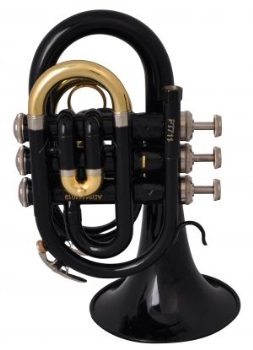 The Prelude PT711B Bb pocket trumpet is both fun and practical. This standard Bb trumpet has a tightly wrapped design that is a total of 10" in length. The .459" medium-large bore and 5" yellow brass bell provide an ease of response with surprising projection. The rose brass leadpipe resists corrosion while the durable stainless steel pistons provide smooth and quiet valve action. The beautiful black lacquer finish provides a subtle warmth to the overall sound.